As a nurse, musician, and poet, Sister Barbara Mary Lanham, OSF speaks this message despite having faced a lifetime of difficult experiences. “We all face challenges and when you learn to let go of yourself, you begin to find God in all things - no matter how difficult,” she said. She was born in Cincinnati, Ohio and learned responsibility at a very early age. When she was eight, her mother was hospitalized and Sister Barbara Mary stayed home from school and cared for her baby brothers. As her mother’s health continued to be a concern, her father decided to move the children to Illinois where they would temporarily live with their aunt. Imagine the circumstances: children separated from their parents only to learn that their father would soon divorce their mother and remarry. “My faith has always been strong and God answered my questions about what was happening in our lives,” she explained. This faith gave her strength as she and her siblings were placed in a Children’s Home in Alton, IL that was managed by Sisters. This new home strengthened Sister Barbara Mary’s faith as she attended daily Mass, worked in the nursery, and took care of the other children when the Sisters attended meetings. As a child she thought: hang in there, all things will pass. “I became increasingly aware that I wanted to give my life to the Lord,” Sister Barbara Mary said. She didn’t talk about her calling with her siblings or friends and was told by others that no Religious Community would welcome her because she was from a broken home. 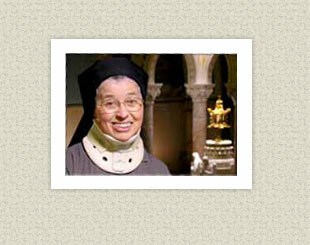 When she was 14 years old, she wrote to the Hospital Sisters about her interest in Religious Life. They responded that she needed to be 16 before entering, but that they had a high school (Aspirant School) that she could attend. On her first visit to the Motherhouse, she recalls the sense of being welcome amid the quiet. “I’ll never forget the first time I entered the Adoration Chapel…it truly is the holy dwelling place of God,” she said. Sister Barbara Mary entered the Community in 1952 and professed Final Vows in 1959. She is a graduate of St. John’s School of Nursing and received a bachelor’s degree in nursing from Loyola University, Chicago. She has served at the Motherhouse, St. John’s Hospital (Springfield), St. Anthony’s Memorial Hospital (Effingham), St. Mary’s Hospital (Decatur), and St. Francis Hospital (Litchfield). She assisted in the first heart catherization at St. John’s Hospital that was performed in the X-ray Department. The greatest turning point in her life occurred in 1970 when she was diagnosed with a spinal cord disease. “I was ready to go home to the Lord,” Sister Barbara Mary said. But God had more work for her to do. “I learned that when God throws you another ball, you grab it and run with it. You make the best of it while knowing that everything is for a reason.” She realized that one must seek God and find God in all things - no matter how difficult. She currently works in the Motherhouse Liturgy Department and among other things, shares her musical abilities as an organist. She also writes poetry of a sensitive nature that she shares with the Sisters and her friends.